Elk Lake’s Nate Preston (21) extends to avoid the block attempt of Susquehanna’s Bryce Baldwin. Not much else escaped Baldwin and the Sabers as they defeated Elk Lake 71-63 behind Baldwin’s 27 points last Tuesday. The collision is on course. The completion of the second week of regular season play resulted in the top two teams set to face off last night (Tuesday, Jan. 15) with Mountain View traveling to Susquehanna. Susquehanna gutted through two tough wins last week to sit even with Mountain View at 3-0 in Division 4. Friday night the Sabers were hosted by Blue Ridge where they earned a 54-51 victory. Susquehanna jumped out to a 14-10 lead after one quarter behind guard Anthony Dolfini’s 8 eight points, including 6 from behind the arc. Mason Deakin added 6 as the Sabers held the lead at the half, 24-21. 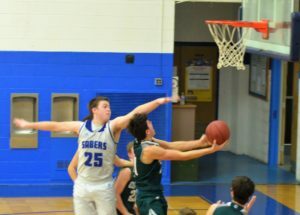 Raider Sam Cosmello scored 7 of his game-high 21 in the quarter to keep Blue Ridge in the hunt. Cosmello stayed hot in the third adding 8 points as the teams battled back and forth but Susquehanna held a one-point lead heading into the final stanza. Deakin helped preserve the lead for Susquehanna burying 7 of 8 free throws down the stretch. CJ Stone knocked down two 3-pointers and also scored 7 points in the quarter. Stone and Deakin each finished with 13 to lead the balanced Saber attack. Dolfini added 11 and Bryce Baldwin chipped in with 10. Cosmello’s 21 points led Blue Ridge and Kaleb Folk added 8. Mountain View kept pace as Mikey Schermerhorn scored a career-high 35 points with the Eagles downing Elk Lake 60-48 the court. The teams played an even first quarter. 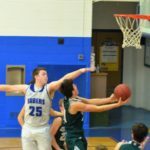 Schermerhorn led off the night with two of his six treys and Elk Lake’s Adam Anderson had two of his own threes as the teams settled the quarter tied at 12. But Schermerhorn was just getting warmed up and ripped off 14 points as part of a 17-2 Eagle run to begin the second quarter and surged ahead 31-18 at halftime. The teams played an even third quarter as both defenses tightened down. The fourth quarter proved a flurry of offense as Elk Lake outscored Moutain View 22-21 but couldn’t surmount the Eagle lead. Schermerhorn was a perfect 8-8 from the line and Tyler Henke and Wyatt Brozonis chipped in with 3 points each. The Warriors’ Nate Preston led the Elk Lake charge scoring 9 of his 16 in the final quarter. Schermerhorn’s 35 and Henke’s 10 paced Mountain View. Preston’s 16 and Kevin Valvano’s 9 led Elk Lake. Earlier in the week for the Sabers Baldwin scored 9 of his game-high 27 points in the third quarter to help Susquehanna pull away on their way to a 71-63 win at home over Elk Lake. Baldwin and Stone combined for 12 points as Susquehanna built a 19-14 first quarter lead. Deakin scored 7 points in the second quarter to extend the Saber lead to 31-24 at the half. Elk Lake’s Joe McAleer kept the Warriors in striking distance scoring 8 of his 14 points in the first half. Down 55-42 entering the fourth quarter, Valvano and Hunter Bomboy tried to rally the Warriors with each scoring 7 points to lead the charge. But Baldwin tacked on 7 more points and Susquehanna overcame a 6-10 performance at the line to hold on for the win. Aside from Baldwin’s 27 Susquehanna’s balanced attack included 18 points from Deakin and Stone chipped in with 14. Bomboy and Anderson led the Warriors with 15 a piece, McAleer had 14 and Valvano added 13. While the Sabers took care of the Warriors, Mountain View hosted Riverside in a Lackawanna League Division III/IV crossover game. Mountain View got off to a slow start as the Vikings led 19-7 after one. The Eagles held Riverside to 5 points in the second quarter but could only match their opponents’ output and trailed 24-12 at halftime. Mountain View made a push in the second half to cut the lead to four with five minutes remaining on the clock. Riverside’s Mike Antonocchi converted 6 of 8 free throws to stave off the Eagles’ rally. Schermerhorn again led Mountain View but was held to 9 points on the night. Blue Ridge kept Montrose winless in the first half as the Raiders prevailed 55-42 at home. Carson Koehler and Ben Bleck combined for 10 points to help Blue Ridge jump out to a 16-8 lead after one quarter. Koehler added 6 more as the Raiders built a 34-19 halftime advantage. Kaleb Folk got hot in the third quarter scoring 13 points including 3 three-pointers. Montrose outscored Blue Ridge 7-5 in the fourth quarter to settle the final score. Folk led Blue Ridge with 19 points; Koehler finished with 14. Brennan Gilhool led the Meteors with 27. Forest City failed to crack double digits in any quarter as the Foresters were felled by Lackawanna Trail 47-30. Cade Hartman and Tyler Clift each scored 8 points to lead Forest City. Lackawanna Trail stayed on the heels of Mountain View and Susquehanna with a 3-1 record after topping Montrose 72-29 on the Meteors’ home court. After falling behind 17-12 after the first quarter the Montrose offense went stagnant and the defense became porous. The Lions took control of the game outscoring the Meteors over the final three quarters. Andrew Rapisardi led Montrose with 11 points and Gilhool chipped in with 9. Forest City was outscored by host Dunmore as the Bucks’ took a 72-21 win over the Foresters. Cade Hartman and Eric Paulin led Forest City with 6 points each. Be the first to comment on "Eagles, Sabers wins set teams to square off"